At eSquared Asphalt Maintenance, our professionals work diligently to ensure professional, complete completion of your project with no hassle to you and no strain on your budget. Our professionals work with you to guarantee your complete satisfaction by discussing all of your options clearly and completely. Call our professionals at 254-716-8685 whether you need patio restoration at your home or you need concrete striping for your Hillsboro, TX business, our experts can complete your project quickly and successfully. Our service providers are trained and knowledgeable on all local and state codes and guidelines to ensure compliant concrete striping in Hillsboro, TX. We provide expert painting that’s accurate and smooth, and deliver extensive product choices to fit your needs and budget. Our team is knowledgeable in all EPA and ADA codes and guidelines to ensure that your job is always finished within compliance. Handicap Striping Our technicians provide professional, ADA code compliant handicap striping quickly and accurately. Handicap Logo Painting For fast handicap logo painting that repairs cracks, peeling, and fading, contact our experts first. 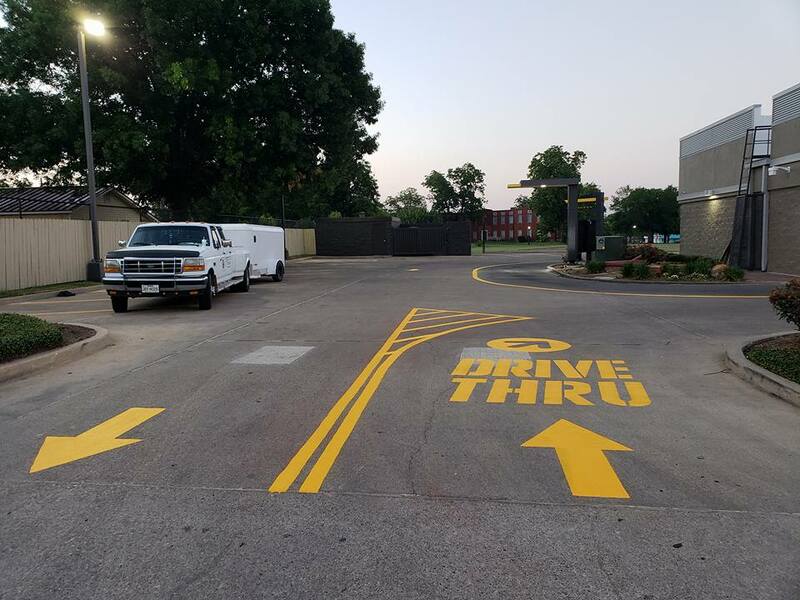 Road Striping Our experts are knowledgeable in all types of temporary and permanent road striping to give expert service, every time. Warehouse Striping If you need reliable warehouse lining that won’t hold up production, call our professionals for comprehensive service and minimal interruption. Reflective Parking Lot Paint Discover what makes reflective paint special and whether it’s the right choice for your project. Our technicians are trained to provide comprehensive pressure washing services for any type of material including wood. We can offer complete cleaning of your soft surfaces without causing damage or streaking. Our professionals will restore the fresh look of your material and maximize its lifespan and resistance. For commercial or residential pressure washing in Hillsboro, TX, turn to the team you can depend on. Contact 254-716-8685 to find out more about our pressure washing services and benefits. Code Compliant Pressure Washing Don’t get fined due to a negligent pressure washing company. Our experts recognize and follow all EPA laws. Driveway Pressure Washing Revive your driveway and eliminate debris that can cause premature aging with our driveway service. Mold, Mildew, and Dirt Removal Completely remove mold, mildew, and algae from your siding, wood, and other outdoor surfaces with our removal system. Restaurant Pressure Washing Stay compliant and patron friendly with complete pressure washing from the dining area to the kitchen, and everything in between. Concrete Stain and Gum Removal Keep your parking lot safe and inviting with our stain, gum, and grease build up pressure washing service. Our professionals can provide installation, repair, and restoration of your concrete structures such as retaining walls, walkways, driveways, and even fence columns. Our experts are trained at specialty concrete and can provide completely customized finishes like decorative or stamped design techniques. We can repair or clean any concrete construct, and provide protection from UV rays, water, and other elements that can cause your concrete to age and degrade. Call the eSquared Asphalt Maintenance professionals when you need concrete services in Hillsboro, TX that you can be proud of. Concrete Bordering and Curbing Discover how our professionals can prevent washout and soil erosion while offering a permanent specialized border. Concrete Patio Pour & Install Service Create your own family outdoor area with our professional installation and customization techniques. Specialty & Decorative Concrete Company Find out how our technicians can provide a completely customized style for your outdoor space that lasts for years. Concrete Waterproofing Service Learn how our professionals can prevent water damage in your concrete with a waterproof coating. On top of the pressure washing and concrete installation and lining services we offer, we also offer additional services. From window washing to gutter cleaning, our clients can come to us when they need other services besides asphalt and concrete services. When you need to set up an appointment time, contact us at 254-716-8685! We are here to help when our clients need additional services and concrete striping in Hillsboro, TX. Window Washing Service For expert window washing at an affordable price, please call us today! Our experts work hard to create lucrative relationships with the leading suppliers to offer you only top quality materials and unparalleled workmanship. 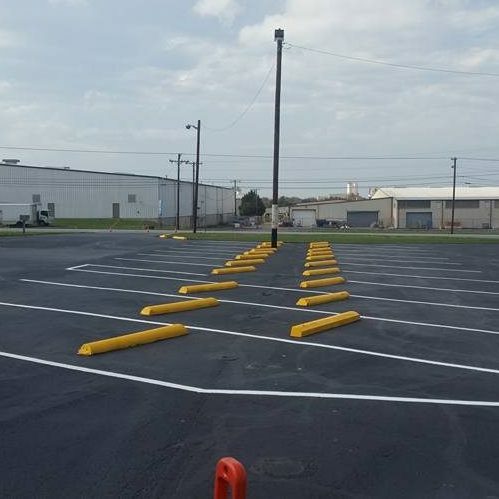 Our experts can deliver all concrete services that you need including parking lot maintenance in Hillsboro, TX, with the utmost dependability and professionalism for your complete satisfaction. Call us today at 254-716-8685 to set up your consultation.